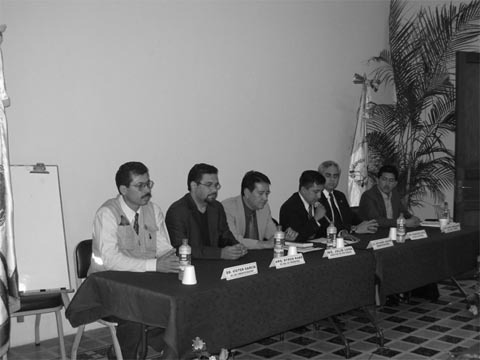 Launching the specialization course entitled "Disaster management and local development"
"...Towards the construction of safe and sustainable municipalities..."
On April 9 2005, and for the third consecutive year, the specialization course entitled "Disaster Management and Local Development" was launched at the Cultural Center of the University of San Carlos de Guatemala (USAC). This course is intended for students and professionals in different fields, as well as for staff members of institutions and NGOs. This represents a joint effort of USAC's Disaster Commission, the Center for Disaster Studies (CESDE), of USAC's School of Engineering, and the Council for Continuous Education, of the Engineers Guatemala Association (CIG). During the opening ceremony, a number of government officials and academia representatives gathered, including Dr. Victor Manuel García Lemus, Executive Secretary of the USAC's Disaster Commission; Mr. Byron Rabé Rendón, representative of the University Outreach Head Office; Mr. Julio Luna, Director of Graduate Studies, School of Engineering; Mr. Estuardo Joachín, Course Coordinator; Mr. Francisco Ruiz, Chair of the Engineers' Association of Guatemala; and Mr. Hugo Hernández, Executive Secretary of the National Coordinating Office for Disaster Reduction (CONRED), who agreed to teach the first lesson on "Kobe, 10 years later", based upon his participation, as a Guatemalan representative, in the recent World Conference on Disaster Reduction held in Kobe, Japan. Efforts to deliver this course were made, to a large extent, due to the importance of this subject matter when addressing disaster prevention, as well as the need to consider it a cross-cutting issue and implement it at both local and municipal levels in order to achieve sustainable development, taking into consideration the Hyogo Framework for Action, adopted during the World Conference on Disaster Reduction, in which USAC participated. Finally, the course is important because of the existing need to foster more national integration processes, such as the one planned by the Supervised Multidisciplinary Professional Practice Program (EPSUM) which, based on Agreement 165-2001 of the Chancellor's Office, dated February 28 2001, led to the creation of the Disaster University Commission. This commission links all academic units and non-professional programs working on this issue. The Engineers Guatemala Association also supports this specialization course through CEDUCA, in order to offer its members an updated training program on disaster management, and to continue promoting the development of the Engineers Volunteer Corps for Disaster Prevention and Preparedness.